CONVERSABLE ECONOMIST: Is Support for Democracy Eroding? "In the past three decades, the share of U.S. citizens who think that it would be a “good” or “very good” thing for the “army to rule”—a patently undemocratic stance—has steadily risen. In 1995, just one in sixteen respondents agreed with that position; today, one in six agree. While those who hold this view remain in the minority, they can no longer be dismissed as a small fringe, especially since there have been similar increases in the number of those who favor a “strong leader who doesn’t have to bother with parliament and elections” and those who want experts rather than the government to “take decisions” for the country. Nor is the United States the only country to exhibit this trend. The proportion agreeing that it would be better to have the army rule has risen in most mature democracies, including Germany, Sweden, and the United Kingdom." 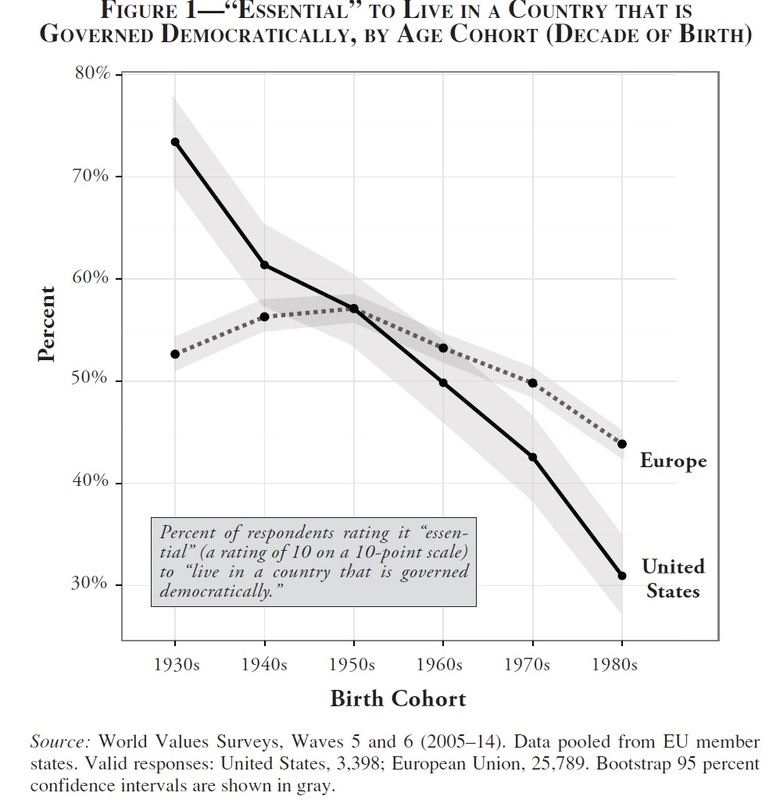 Roberto Stefan Foa and Yascha Mounk lay out a variety of evidence on these themes in "The Democratic Disconnect," in which appears in the July 2016 issue of the Journal of Democracy (27:3, pp. pp. 5-17). Their opinion data is drawn from the World Values Survey, which relies on a network of social scientists, now active in about 100 countries around the world, who do surveys using a common set of questions. Foa and Mounk offer a variety of detailed insights into attitudes about democracy: here, I'll just highlight a few results that caught my eye. 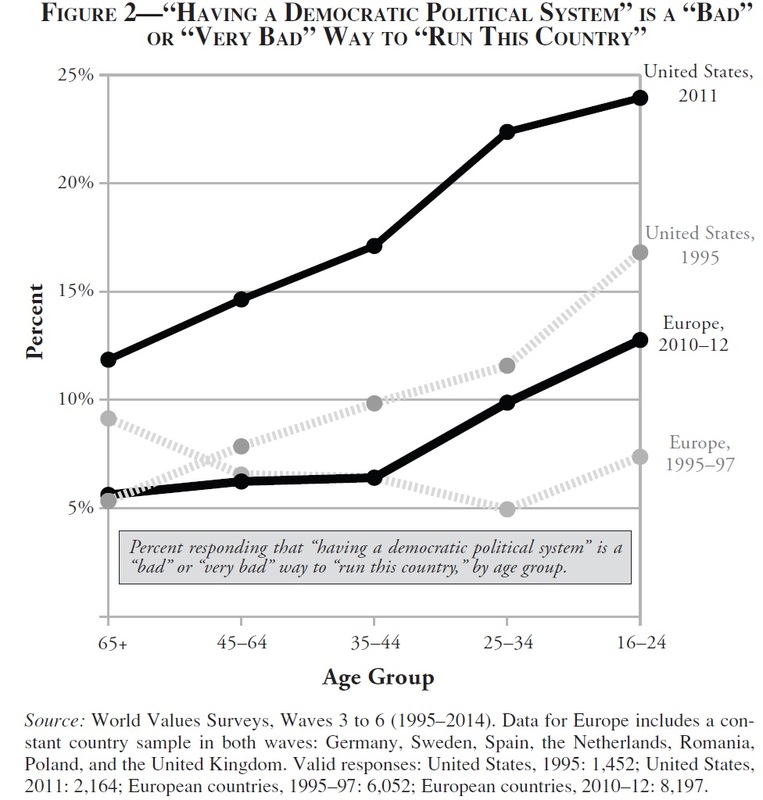 One is that the lower support for democracy seems especially high among younger adults. The horizontal axis on this figure shows the decade in which people were born: thus, older respondents are on the left and younger respondents are on the right. 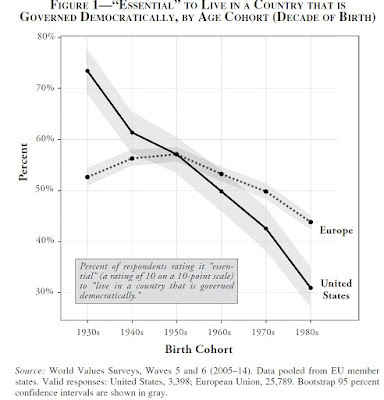 In both the US and in Europe, young adults have become less likely to say that it is "essential" to live in a democracy. 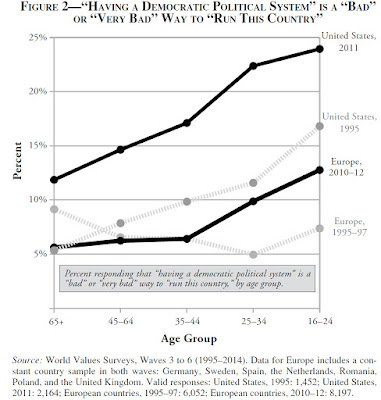 Conversely, the share of people saying that a democratic political system is a bad or a very bad way to run the country has risen since the mid-1990s, and this attitude is also more prevalent among younger adults. 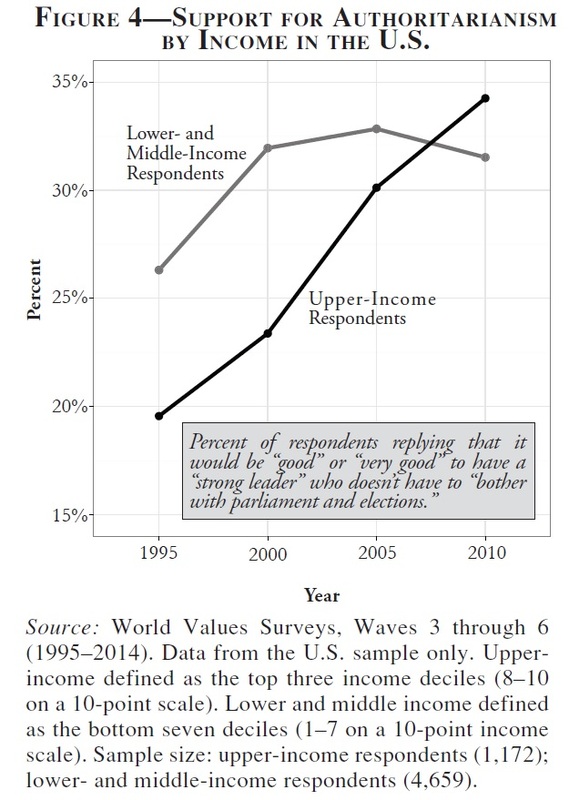 In the US, the support for a "strong leader" who doesn't have to "bother with parliament and elections" has especially risen among those with higher income levels. Foa and Mounk have a lot more to say in breaking down these patterns and trends. I'll only add that it seems to me that many people in the US and elsewhere are feeling the pull of what I call the "technocratic temptation." In this view, our economic, foreign policy, and social issues have clear-cut answers. If we would all just came together as a unified nation, put the appropriate technocratic experts in charge, and shut up those who disagree, then the experts could put those clear-cut answers into effect. My own view is that many deep problems don't have simple answers; while experts can be useful in contributing information and insight to social disputes, they can be at least as nutty in their social values and decision-making as anyone else; and ongoing disagreements on many issues should be viewed as healthy and productive, even though it means accepting that a certain number of issues will never be fully settled. For those who feel the need for an obligatory quotation here from John Stuart Mill, here's one.